One of the first decisions to make is whether your flock will be primarily for eggs, or meat, or both. Although in the past a barnyard flock provided both meat and eggs as well as new chicks to maintain or increase flock size, this is not so much the norm any more. As a result of breeding and the demands of commercial meat and egg production, chicken breeds have become highly specialized. As an example, the Cornish Cross is one of the dominant breeds for meat – simply because it can go from chick to table in about seven weeks. To do this, it has been bred to eat vast quantities of feed and to pack on weight at a rate that rapidly outstrips other chicken breeds. Without careful monitoring of flock feed rates, Cornish Crosses are at high risk of early death from various physiological problems. Even with proper feeding and care, they generally do not survive longer than a few months, and are not likely to reproduce. Thus they are poor choices for egg laying and flock sustainability. 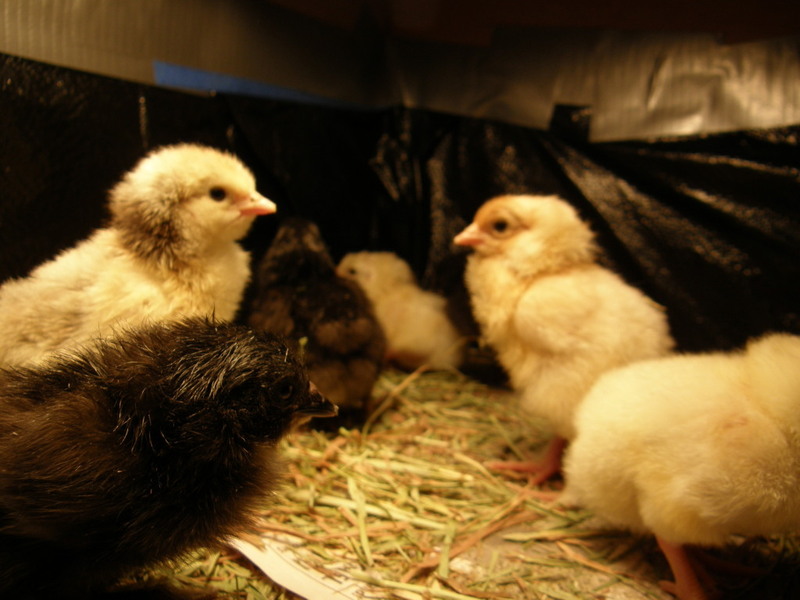 If you plan on raising meat birds, plan for having to purchase and raise chicks every year. While it is a good idea to invest in at least one general book about raising and keeping chickens, and the CES publication summarizes very well the basics for starting a flock here in Alaska – here are some points to consider when evaluating whether chickens would be a good undertaking for your household. While meat birds that are raised locally are far superior in taste and quality to commercial chicken’s, raising them, even in a place like Fairbanks where commercial chicken food is readily available, is more expensive per pound than purchasing chicken from the store. In a remote village, freighting in commercial chicken feed will contribute significantly to the cost per pound of meat. The trade-off is that the taste and quality of meat from chickens raised locally and in a small, non-commercial setting is superior, and you know what’s in your chicken meat, because you know what you have been feeding your chickens. As a result of corporate farming and the demand for chickens to grow bigger faster and produce more eggs, the natural instinct to brood and hatch their own eggs is quickly being bred out of chickens. Thus, it can be hard to establish a flock which has hens (called broody hens) willing to sit on eggs long enough to hatch them. Most small poultry farmers purchase commercial incubators if they want to raise their own chicks – even if they have some hens that will sit on nests. Factor this in, as well as of course having at least one rooster, when planning for flock sustainability. Laying hens generally begin laying when they are about five to six months old. Their peak productive years are from one through about three. After that, egg laying declines substantially. Unless you want to maintain hens into their old age (they can live to be as old as nine or 10, although that is rare), you will need to raise additional chicks every two to three years to maintain egg production – as well culling the hens that are getting older. Although not as large or as tender as birds raised solely for meat, laying hens may be butchered for food; laying hens make good soup and stews; these were typically called “stewing chickens” before the advent of corporate poultry operations. Although not a concern with meat birds, which are butchered in the fall, a laying flock will need a winterized coop that is warm, dry and with sufficient room to house all of the chickens comfortably and healthily through a long Alaskan winter. Minimum equipment includes a heat lamp, a regular lamp on a timer, and a water heater. Heat lamps and water de-icers draw significant power. In a small coop located in Fairbanks, the average increase in the electric bill during very cold months is about $30; the cost would be even higher in remote villages. 2 Responses to Meat or Eggs? Are there still breeds of chickens that will hatch their own chicks available and if so what are they and how do I get them? Yes – there are – many of the most common breeds (including those I have listed here) will go broody from time to time and hatch eggs. The trick is in the timing. You don’t want a broody hen in the dead of winter – which is the only time my hens seem to get in the mood to sit on their nests.